Do You Really Know How to Eat Fruits? This book teaches you how to eat fruits. Do you know the best time to eat fruits? Is it better to eat fruits directly or drink fruit juice? Can diabetics eat fruits? Which fruit can make you look younger and more beautiful? 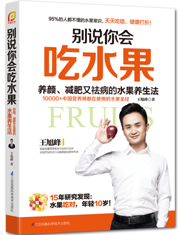 All the answers can be found in this book written by Wang Xufeng, an expert on public dietary health from China Cuisine Association and executive president of the Capital Healthcare and Nutrition Cuisine Society. Contact UsCopyright © Phoenix Publishing & Media, Inc. All rights reserved.